An Autostrada (plural autostrade) is an Italian toll road, usually the quickest way to get between two cities by car. The maximum speed on the autostrada is 130 kilometers per hour, although in built up areas or in work zones the maximum speed can be reduced. One drives in the right lane on the autostrada and moves to the left lane briskly and temporarily--and only to pass. You will come to grief if you like to dawdle in the left lane, trust me. The trick for travelers is to be in the correct land for toll collection. You'll need to follow signs with a stick-figure driver paying an attendant. These usually direct you to the right. Signs with money usually indicate a coin-collection toll booth. These are tricky in that sometimes you don't know how many coins you'll need until you pull up to the booth. If you don't like paying the tolls on the autostrada, you can usually find a road labeled "ss" on your map, paralleling the autostrada. Those are "strade statali" or state roads. The speed limit is 70-110 km per hour when it's clear for a stretch, and 30-50 near towns. They are twistier and usually far more scenic but they can be very slow. 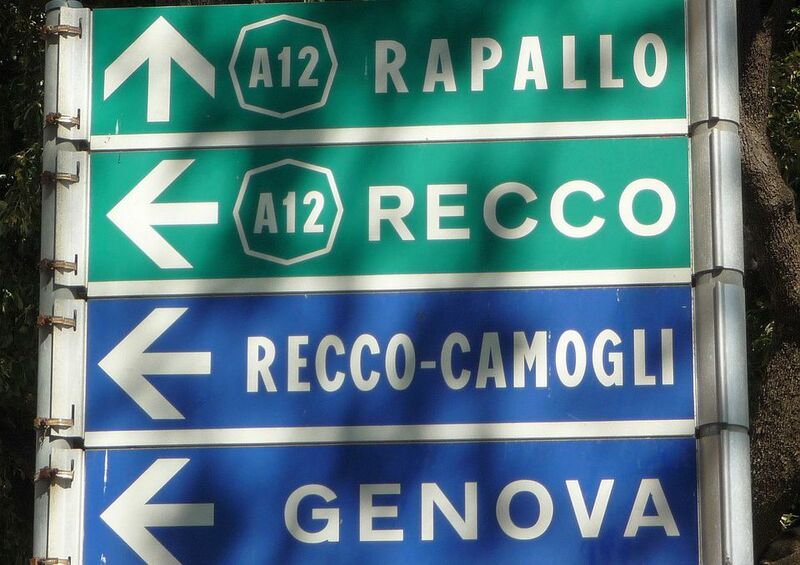 Autostrade are marked by signs with an "A" followed by the autostrada number on a green background, other roads are marked with road numbers on a blue background (as you can see on the photo). Wandering Italy has an excellent Interactive Autostrada Map. See more Tips for Driving on the Autostrada, including how to find the tolls, and What to Know About Driving in Italy.